List of seminars, conferences, forums and activities that will be organized in Southeast Asia. The 2nd main objective of NSM is to contribute towards the implementation of various community nutrition programmes, to promote healthy eating and active living amongst all Malaysians. NSM has published numerous educational resources to empower the public with appropriate, unbiased information. 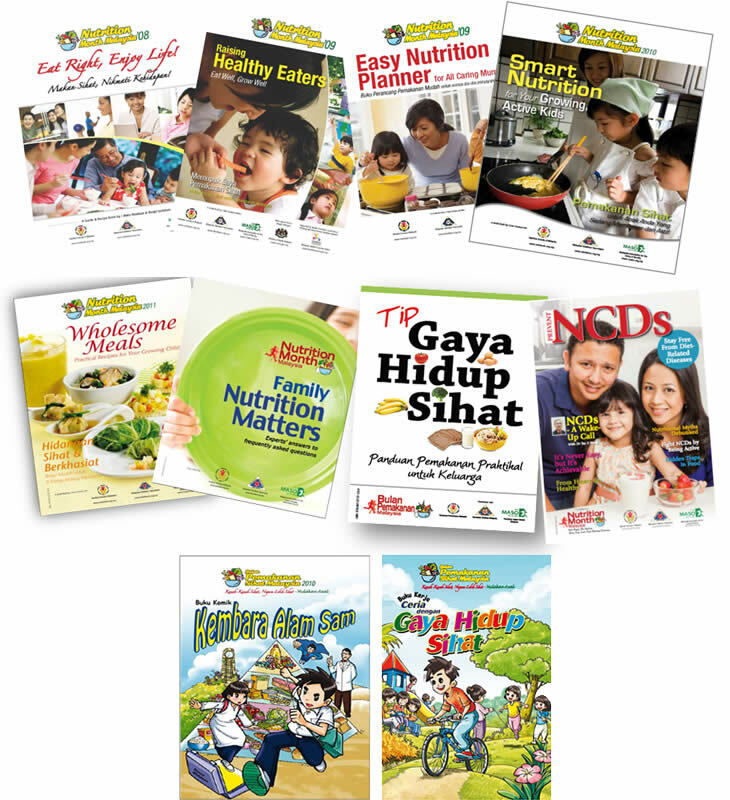 A series of leaflets to promote understanding and usage of the Malaysian Dietary Guidelines 2010. A series of leaflets to promote healthy eating and active living amongst women. Healthy Recipes and Nutritionist's Choice Cookbook. The Nutrition Society of Malaysia has carried out community nutrition promotion programmes for specific groups for over 2 decades. Particular attention has been given to infants and children, as well as for pregnant and lactating women. The objective of this programme is to improve nutrition knowledge and promote healthy lifestyles among school-going children in Malaysia. This programme is timely in view of the significant prevalence of nutrition-related problems, such as nutrient deficiencies and obesity, among Malaysian schoolchildren. The Healthy Kids Programme in Malaysia was launched in August 2010 with the theme “Let’s Be Healthy!” or “Jom Sihat!”. The Programme is targeted towards children aged between 7–12 years and is part of Nestlé’s global programme, which aims to raise nutrition, health and wellness awareness among school-aged children around the world through better eating habits, increased physical activities and other key health measures. Mothers have always been concerned about their children’s nutrition. Should the baby be breastfed? When should she start feeding the baby solid food? Making good nutritional choices for their babies can be challenging, especially when many mothers today are juggling work and home responsibilities. To address these mothers’ concerns, the NSM spearheaded a three-phase programme, Mother’s Smart Choice (MSC), which aims to promote good infant nutrition and offer practical tips that the working mother can incorporate into her daily schedule. MSC was launched in 2011 in collaboration with the Obstetrical and Gynaecological Society of Malaysia (OGSM), Malaysian Paediatric Association (MPA) and the National Population and Family Development Board (LPPKN). The Mi-CARE training and education programme is spearheaded by four leading professional bodies in Malaysia; the Obstetrics and Gynaecological Society of Malaysia (OGSM), Nutrition Society of Malaysia (NSM), National Midwifery Society of Malaysia (NMSM) and Malaysian Paediatric Association (MPA). The programme’s main objective is to empower nurses, nurse aides and midwives from both private and government O&G, paediatric clinics and maternity centres. This is achieved by providing them with relevant information on pregnancy, labour, birth and post-partum care. They are then able to provide accurate information and advice to expectant or new mothers. A series of 3 leaflets (in English) have been published for dissemination to the public. Launch on 22 October 2013, the BrightStart4Life (B4L) programme is a long-term educational programme aimed at promoting optimal nutrition for infants (0-<1 year), infants with special feeding needs and young children (1-6 years). A series of booklets and articles shall be published, targeted at both public (young parents) and healthcare professionals (HCP). 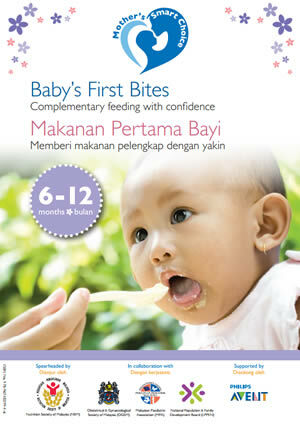 B4L is an experts' based initiative, spearheaded by the following professional bodies; Nutrition Society of Malaysia (NSM) as the lead initiator in collaboration with Malaysian Paediatric Association (MPA), Malaysian Medical Association (MMA) as joint initiators and supported National Population & Family Development Board (LPPKN). A new child education programme based on the Malaysian Dietary Guidelines for Children and Adolescents was launched in 2014, with the aim to promote Malaysian Dietary Guidelines for Children and Adolescents through 4 pillars: MyNutriBaby, MyNutriJunior, MyNutriKid and MyNutriTeen. With the belief that good nutrition should be practised from young and motivated by the Ministry of Health’s Malaysian Dietary Guidelines for Children and Adolescents (MDGCA), Nutrition Society of Malaysia (NSM) has taken the initiative to spearhead MyNutriBaby, an infant and young child nutrition promotion programme to help parents improve their children’s nutritional status for optimal growth. 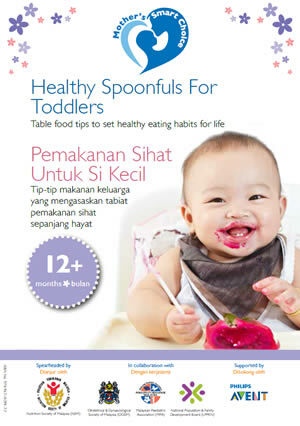 MyNutriBaby aims to translate the key messages of the Malaysian Dietary Guidelines for Children and Adolescents, released by the Ministry of Health in 2013, into simple easy-to-follow messages for the public. MyNutriBaby was launched in 2014 in collaboration with Obstetrics and Gynaecological Society of Malaysia (OGSM), Malaysian Paediatrics Association (MPA), and National Population and Family Development Board (LPPKN). 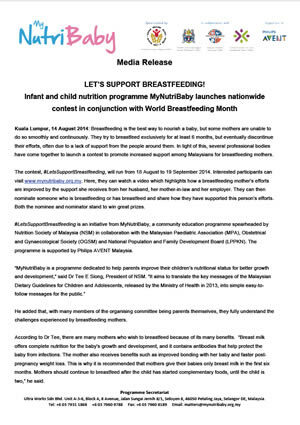 In conjunction with the World Breastfeeding Week, a video on supporting breastfeeding has been produced under MyNutriBaby and it links to a nationwide contest #LetsSupportBreastfeeding (18 August – 19 September 2014) to further promote breastfeeding. The Nutrition Month Malaysia programme (NMM) was founded in 2002 by three leading professional bodies, namely the Nutrition Society of Malaysia (NSM), the Malaysian Dietitians’ Association (MDA) and the Malaysian Association for the Study of Obesity (MASO). As the country’s premier nutrition education initiative, the NMM programme receives support from the Nutrition Division of the Ministry of Health Malaysia (MOH). NMM is a non-profit programme that focuses on promoting healthy lifestyle and is spearheaded by a National Steering Committee (NSC) with representatives from the three professional founding bodies and the Ministry of Health. Each year, a guidebook has been published to provide the public with appropriate information on healthy eating and active living. It was all about fun and healthy living at the annual Nutrition Month Malaysia (NMM), the nation’s premier nutrition education programme! 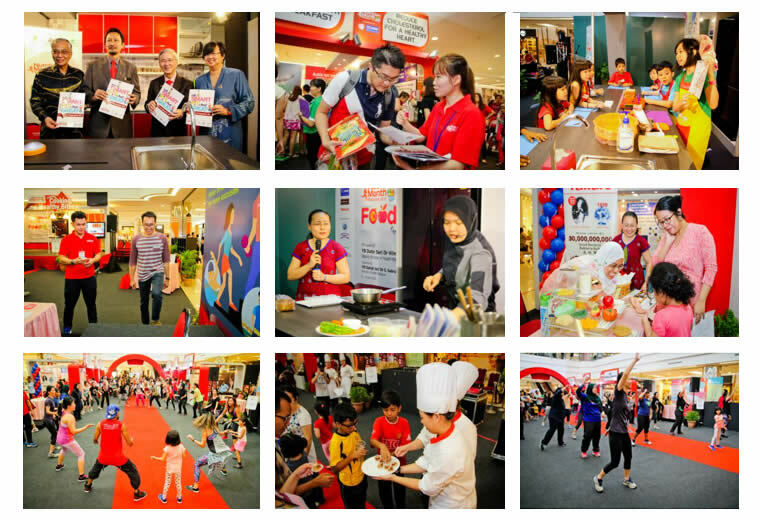 Launched by Dato’ Saiful Anuar bin Lebai Hussen, the Deputy Secretary-General (Management), Ministry of Health Malaysia, the Nutrition Month Malaysia (NMM) 2016 Food-Fit-Fun Fair was successfully held on 6-10 April 2016. Recognizing the alarming trend of non-communicable diseases (NCDs) amongst Malaysians, the NMM 2016 with the theme ‘Eat Smart, Get Fit & Feel Great’ aims to highlight smart eating and active living as central towards healthy living. The NMM 2016 kicked off with the launch of the 5-day Food-Fit-Fun Fair, an educational and interactive fair which hosted many different interactive booths with themes such as ‘Energise your Day with Breakfast’, ‘Reduce Cholesterol for A Healthy Heart’, ‘Caring for your Digestive Health’, ‘Balance your Gut Bacteria for Good Immune System’, ‘Go Whole Grains’, ‘Milk is Nutritious and Delicious’ and ‘Go Light when you Grab A Bite’. Visitors also enjoyed and appreciated the free interactive sessions they had with nutritionists, dietitians, and physical activity experts. The highlight of NMM this year was the series of healthy cooking demonstrations by chefs and nutritionists. The kids also had a lot of fun cultivating their culinary curiosity at the cooking workshop session for kids. For fitness enthusiasts, they too had an amazing time dancing at the zumba session led by the lively and energetic professional instructor. Various educational materials together with the annual NMM publication, an infographic kit entitled ‘Eat Smart, Get Fit & Feel Great: An Infographic Kit’ were also distributed to the public. A series of educational press articles related to healthy eating and active living were published on selected Malaysian newspapers and magazines throughout the months of March and June. The public can also access past publications, press media, updates on nutrition tips and facts as well as photos of past NMM events through NMM’s Facebook page or NMM’s website. 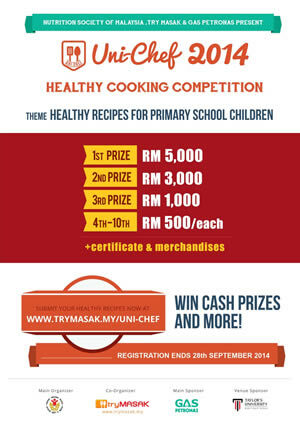 The grand finale of the Uni-Chef 2014 healthy cooking competition, organised by Nutrition Society of Malaysia and video recipe portal Try Masak with PETRONAS Dagangan Berhad as the main sponsor, had been successfully held at Taylor’s University Lakeside Campus, 12 December 2014. Uni-Chef aims to help create a new generation of society that is aware and knowledgeable about healthy eating. It is also hoped to become one of the main sources of reference for parents in providing healthy food for their children.The theme chosen for the inaugural competition is “Healthy Recipes for School Children”. The competition was opened to all diploma and degree students in public and private institutions registered with the Ministry of Education Malaysia. More than 275 students from 23 higher education institutions participated the competition. Participants went through two rounds of selection before making their way to the grand finale. In the first round, interested participants submitted their healthy recipes to the Uni-Chef website for evaluation by nutrition experts from Nutrition Society of Malaysia. Students who were selected for second round were invited to record a cooking demonstration video for public voting online. The 10 most popular videos were then invited to participate in the grand finale. Two students from Universiti Teknologi MARA (UiTM), Nur Sarah Abdul Rahim and Azeera Hashim emerged champions of this competition with their dish ‘roasted vegetable pasta served with almond crusted chicken fingers’. 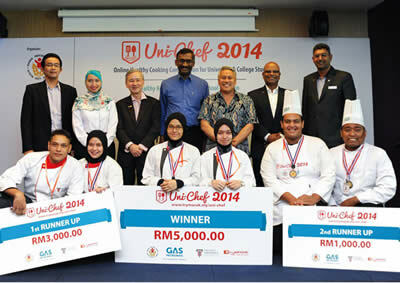 Celebrity chef Dato’ Chef Wan, who was among the panel of judges for Uni-Chef 2014 was impressed by the finalists’ efforts, particularly those that incorporated different ingredients into one dish instead of multiple dishes. Group photo of the organizers, sponsor, judges and winners. Good nutrition is the cornerstone to overall health and wellbeing of the community. Optimal nutrition practices shall start from young, as it impacts children’s growth and development. Breakfast, being the first meal of the day, provides the energy and nutrients for a proper start to the day. It is an integral part of healthy eating and has been associated with several positive health outcomes in children including better nutrient profiles, body weight status and cognitive functioning. Recognising this, the Nutrition Society of Malaysia (NSM) had initiated the MyBreakfast Study in 2013, which is a comprehensive and nationally representative study on breakfast habits among 8,705 primary and secondary school children in Malaysia. The study was aimed at determining the prevalence of underweight and overweight among school children in Malaysia; breakfast habits among children and adolescent; the contribution of breakfast towards energy and nutrient intake; and the association between body weight status, physical activity and breakfast consumption among the children. The study has been concluded and the key findings of the study have been shared with the main stakeholders, including policy and programmes managers, researchers and educators through a symposium organised by NSM on 3 Dec 2015, at Hotel Istana, Kuala Lumpur. The symposium provided an insight into breakfast habits, whole grain consumption, as well as current nutritional status and physical activity level of school children in Malaysia. Several recommendations, which can be useful to direct various educational programmes to encourage school children not only to consume breakfast regularly, but also to choose healthier food options, have also been discussed. 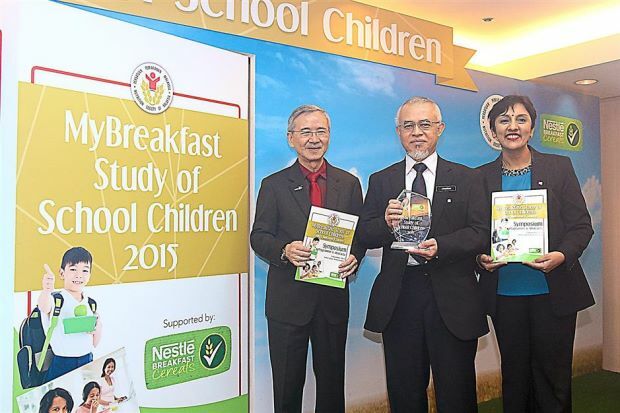 (From left) Dr Tee E Siong, President of Nutrition Society of Malaysia; Dr Zaharian Zainuddin, Deputy Director, School Management Division in the Education Ministry; and Ms Nirmalah Thurai, Country Business Manager for Nestle Breakfast Cereals at the stakeholders & media announcement of MyBreakfast Study of School Children. Malnutrition, in every form, including undernutrition, micronutrient deficiencies, overweight and obesity could be life-threatening and is not only impacting negatively on our physical and cognitive development, but it also compromising the immune system thus leading to a higher susceptibility to communicable and non-communicable diseases. This situation also contributes to a negative social and economic consequence to all nations. Malaysia is also one of the countries that are experiencing the double burden of malnutrition, where we are still dealing with some issues of micronutrient deficiencies and at the same time, over-nutrition figures have increased markedly in recent years. Ensuring a healthier Malaysia is the responsibility of all stakeholders. In order to combat the prevalence of the double burden of malnutrition, a multi-dimensional approach needs be taken. Government ministries and agencies, private sectors, academic institutions, professional bodies and non-governmental organisations must play different roles in promoting better nutrition, in order to pave the way for healthier Malaysians. 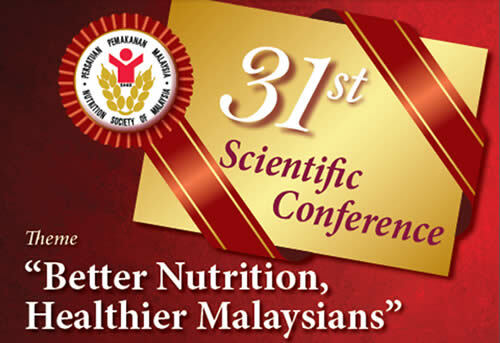 With the theme: Better Nutrition, Healthier Malaysians, the 31st NSM Annual Scientific Conference provided a platform for all stakeholders to share research and intervention activities that contribute towards the implementation of the NPANM III (2016 – 2025). The Conference was successfully held on 31 May – 1 June 2016 at Hotel Istana, Kuala Lumpur and was declared open by the Deputy Minister of Health Malaysia YB Dato’ Seri Dr Hilmi bin Haji Yahaya. The Conference was attended by over 350 participants and featured 32 oral presentations from a mixture of speakers of international and local speakers from the academia government agencies and private sectors. There were two dedicated symposium sessions focused on the theme of the Conference, a focused session on infant and young child nutrition, a session for members to highlight a variety of nutrition research topics and a session where industry experts shared their contribution in promoting better nutrition. The Young Investigators Symposium also provided a platform for young researchers from more local universities to share their findings and presentation skills. There were 160 poster presentations covering a wide range of nutrition-based research. A pre-conference scientific symposium on Nutrition & Health Benefits of Fibre was also offered to the participants in conjunction with this Conference. 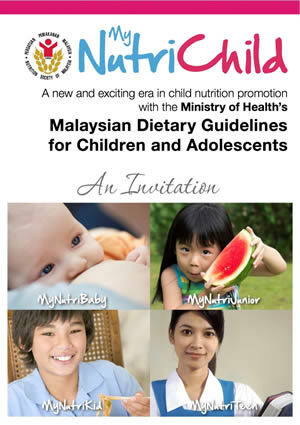 A new child education programme based on the Malaysian Dietary Guidelines for Children and Adolescents, to be launched in 2014. The paramount importance of empowering school children with appropriate knowledge of healthy eating and active living has long been recognized. To this end, Healthy Kids Programme Malaysia, as part of the Nestle Healthy Kids global programme, conducted a 3-year longitudinal school-based intervention study to develop, implement and evaluate a nutrition education package appropriate for primary school children. It is envisioned that the educational package developed can be implemented in all primary schools in the country to arrest the increasing prevalence of overweight and obesity among school children. A total of 250 (143 intervention, 107 control) standard 3 students (9 years old) were recruited from 12 selected primary schools in Klang Valley, Malaysia. The intervention group were taught 6 educational modules each year. Till end of 2012, the intervention group has received 12 educational sessions, throughout Year 1 (2011) and Year 2 (2012). Each year, a pre-intervention and a post-intervention survey was carried out to determine the level of the children’s nutrition knowledge, attitude and practices (KAP). Significant improvement was seen in the intervention group children’s mean knowledge (from 54.6±10.1 to 68.0±14.1, p<0.001) and practice score (from 71.9±8.9 to 76.1±8.4, p<0.001). The improvement of the mean knowledge score among the intervention group was significantly higher than that of the control group (F(4.9), p<0.01). The mean attitude (F(1.7), p>0.05) and practice scores (F(1.7), p>0.05) of the intervention group was also higher than the control group, but these differences were not statistically significant. The Year 3 (2013) intervention educational sessions commenced at the beginning of 2013 and were just completed. The study is a nationwide cross-sectional study aimed to determine socio-demographic background, body weight status, physical activity, breakfast habits and the types of foods and beverages consumed at breakfast among school children and adolescents aged 6 to 18 years in Malaysia. Carried out in collaboration with Cereal Partners Worldwide and Nestle, the study also collected information on fortified foods including whole grains, ready-to-eat cereals (RTEC) and fortified beverages. Data collection was conducted from April to October 2013 in five regions in Malaysia, namely Northern, Southern, Central and East Coast of Peninsular Malaysia, as well as East Malaysia (Sabah and Sarawak). By using multistage sampling, schools in both urban and rural area of each state of the regions were randomly selected based on the list of public primary and secondary school register in each of the states as of 31st of January 2011 provided by the Ministry of Education Malaysia based on the Education Management Information System (EMIS). Data analyse is continuing and full reports of the findings are expected to be ready by middle of 2014.